The season has started Down Under and Caleb Ewan takes the win. Reports from Australia and the National cyclocross championships in Europe. Chris Horner to race in 2019 - Top Story. Other cycling news: TDU team previews, teams for the Tour de France and women's Omloop Het Nieuwsblad, Kasper Asgreen extends, Lotto Soudal look ahead, Fabio Jakobsen talks 2019, Max Richeze accident, UAE Team Emirates/Stages, Astana/Northwave, Alberto Contador/Gobik and Froome and Borat/Sagan. Monday coffee time read. TOP STORY: Chris Horner Still a Pro at 47! Davide Rebellin is going to race for another year in the professional peloton and will be joined by Chris Horner. The man who won the 2013 Vuelta a España at 41 has confirmed he will turn out for Team Illuminate in 2019. The team wrote on social media: "The team STILL KICKIN'! The one and only @hornerakg completes Team Illuminate's roster for 2019! It's a privilege to have the 2013 Vuelta a España champion continue to ride with us and we're looking forward to see him race whenever he's ready. GO, CHRIS! #illuminatethebike." Horner's career started in 1997 when he rode for La Française des Jeux. He also rode for Mercury, Prime Alliance, Saturn, Webcor Builders, Saunier Duval-Prodir, Predictor-Lotto, Astana, RadioShack and Lampre-Merida. Since 2015 Horner has been riding for US Continental teams: Airgas–Safeway, Lupus Racing Team and from June last year for Team Illuminate. In 2018 Horner participated in the American championship and the Romanian Sibiu Cycling Tour. With so many unemployed riders going into the 2019 season, should riders in their 40's be taking out professional licenses? 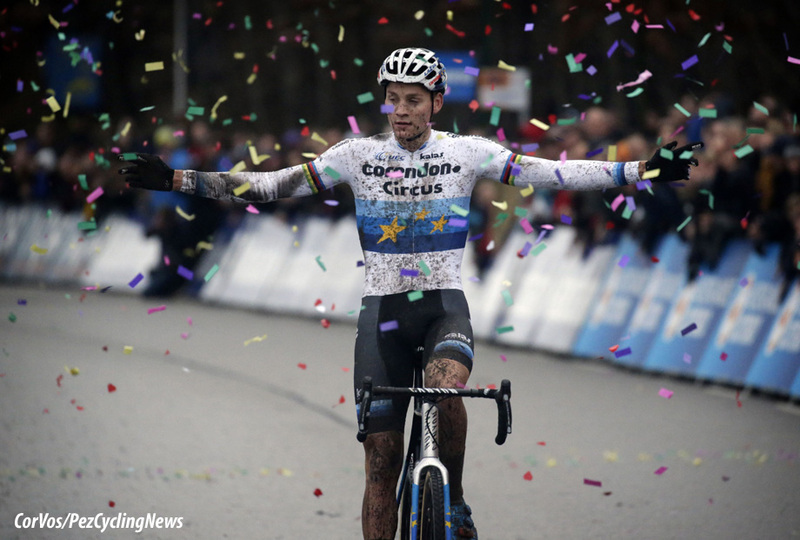 Mathieu van der Poel (Corendon-Circus) won his 5th National Dutch cyclo-cross championships in a row on Sunday in Huijbergen. Lars van der Haar (Telenet Fidea Lions) took he silver medal and Corné van Kessel (Telenet Fidea Lions) the bronze. Stan Godrie had the fastest start, but Mathieu van der Poel was immediately on his wheel and quickly took the lead. At first Corné van Kessel, Lars van der Haar and Joris Nieuwenhuis were able to hold on the European champion's wheel. Van der Poel didn't hold back and while the heavens opened up above the North Brabant race site, he shook off one competitor after the other. Van Kessel was the last to hang on, but he also had to drop off. Van der Poel continued to stretch his lead and Van Kessel seemed on course for second place, but a fall allowed Van der Haar to get back to him. Van Kessel cracked and eventually had to let his teammate go. Van der Poel rode steadily on for the win. 2019 Dutch National Cross champion, Mathieu van der Poel (Corendon-Circus): "The race should always be held, but I felt really good. It is a course that I know inside out, so it was fun to race around here. It was extremely slippery and the equipment should always keep you up-right, so I'm glad I hit the finish in one piece. I was pleasantly surprised by the crowd, because the weather was not very good again. It is always nice to be able to race around in this atmosphere.. The World Championships in Bogense? "It is hoped, it will be time". 2nd, Lars van der Haar (Telenet Fidea Lions): "It is clear that one is better and then you have to put yourself in the position that if something happens to you, you could win. That worked out reasonably well, only, he had no problem today. I think I've fallen twice, been slanted a few times and once on the bars when I thought I was locked into my pedals. Small mistakes, but you still lose a few seconds each time. I think becoming a world champion this year is not normally feasible, but I would love to be on stage. That is feasible for me, I think. I want to continue as I do now. And also have the luck of the day." 10. Gert-Jan Bosman at 7:27. 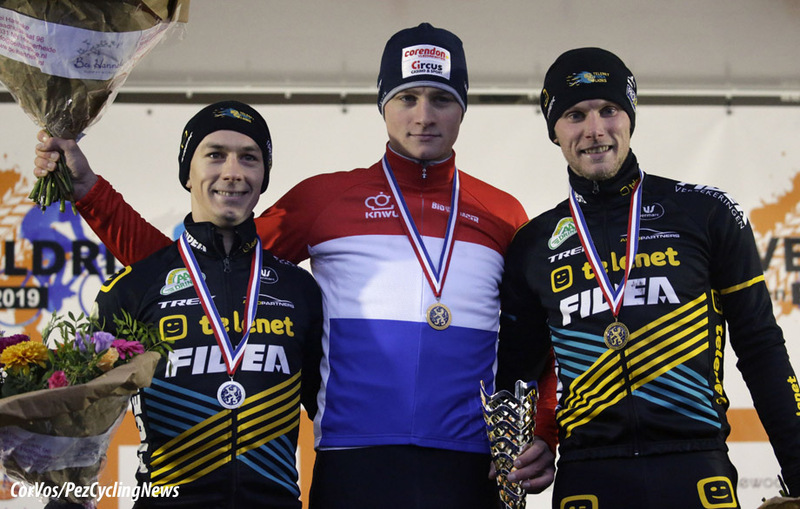 Toon Aerts (Telenet-Fidea) became the new Belgian cyclocross champion on Sunday in Kruibeke. Aerts took the tricolor jersey from World champion Wout van Aert (Cibel-Cebon), who battled until the start of the final lap. Michael Vanthourenhout (Marlux-Bingoal) was third at nearly three minutes. Michael Vanthourenhout started fast and put World champion Wout van Aert in trouble. Aerts held on and took over the lead on the second lap. The World champion was at 5 seconds, but he did not give up and got back to the front by the halfway point and Vanthourenhout paid for his quick start. Van Aert was not really impressed with the fast start of Aerts and immediately took over. The World champion was able to start the technical sections in the lead, which turned out to be too much for Aerts as he lost more than 15 seconds. But due to a fall and a delay to Van Aert, Aerts got his strength back. 15 seconds became 5, and 2 laps from the finish, the former European champion made contact again. Aerts not need time to recover and almost immediately attacked with an explosive jump and soon had 20 seconds. The World champion battled back to 12 seconds at the start of the final lap, but the race was over and he lost nearly a minute by the finish line. Toon Aerts became the Belgian champion for the first time in his career. 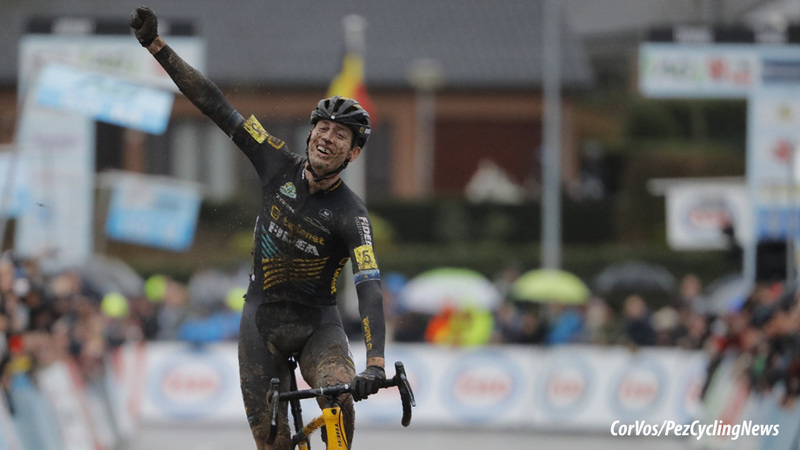 2019 Belgian National cross champion, Toon Aerts (Telenet Fidea Lions): "When I saw the mental strength of Wout van Aert a year ago in the run-up to the World Cup, I was very impressed. I thought then: I want to be able to do this. In the meantime I am worn out. Successfully! First and foremost, I knew very well that I had fallen behind on Wout because of a mistake on one of the sloping sides. Otherwise there was no loss at that moment. So I continued to focus on myself. Try to limit the error load on the technical passages, in combination with cycling as hard as possible in the mud lanes. And continue to work from the first to the last meter. That is not new, though. I've been doing this for a whole winter behind Mathieu van der Poel. When I came back to Van Aert and I made a good passage on the stretch past the finish, I could reverse the roles and put pressure on him in turn." 2nd, World champion Wout van Aert (Cibel-Cebon): "Of course I am disappointed. I had come to win. But today I never had the feeling that I had in other championships. I am a winner, huh. Especially in a championships. And I felt fine in my skin the last few days. My last race in La Mézière was just right. I thought I'd be ready for this Belgian championship just in time. I myself never had the feeling I had in the other Belgian and World championships. Toon Aerts was stronger in the last two laps. Why could not I handle him? I do not have an explanation for that. Apparently it is not easy to reverse a negative trend at once. It has been on and off all season. Today was clearly not my best day. It may just be that I know a top day in Bogense." 10. Nicolas Cleppe (Bel) Telenet Fidea Lions at 5:06. 3. Roberto Carlos Guimarães Ferreira. 3. Javier Ruiz de Larrinaga Ibañez. 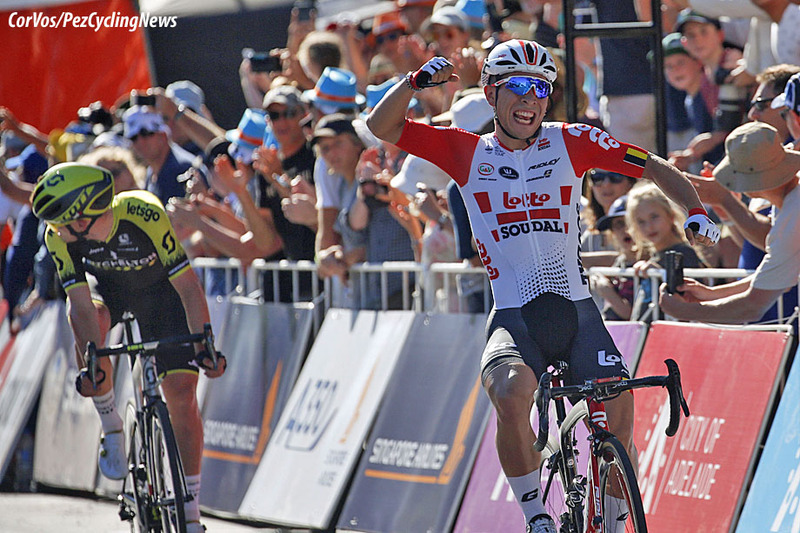 Caleb Ewan started the season 2019 on a high note by giving his new employer, Lotto Soudal, their first win. The Australian won the Down Under Classic for their own people on Sunday in a crazy sprint that saw a crash ruin many hopes. The 24-year-old beat last year's winner, Peter Sagan (Bora-Hansgrohe) and Alexander Edmondson (Mitchelton-Scott). Four Australian riders took up the early action: Simon Clarke, Ben O'Connor, Lachlan Morton and Neil van der Ploeg had a maximum lead of 20 seconds. However they were swallowed up by the peloton. Next it was Manuele Boaro, Steve Morabito, Joey Rosskopf and Chris Harper who took their chance, but it was short lived. The sprinter's lead-out trains soon came into play with Lotto Soudal (Ewan) and BORA-hansgrohe (Sagan) trying to control the race. This resulted in a nervous peloton and a big crash was on the horizon. The main victim was Phil Bauhaus, the young German from Bahrain-Merida could not rejoin the race. On the final corner there was another crash, this time including Danny van Poppel. This crash left only a few riders at the front with Ewan and Sagan well to the fore. Sagan's team mate Daniel Oss tried to take advantage of the chaos, but the Italian was pulled back by Ewan's last man, Roger Kluge for the diminutive Australian to take the win. 2nd, Peter Sagan (Bora-Hansgrohe): "I'm happy with my result today. It was a hot and fast day and I'd like to thank all my teammates for their work, especially Daniel Oss, Oscar Gatto and Maciej Bodnar that protected me. They helped me keep clear of the crashes in the finale and that was important today. 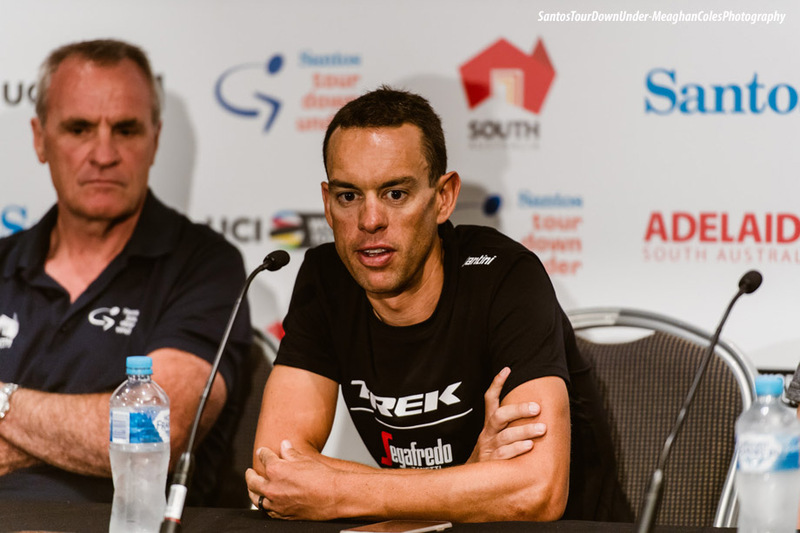 Overall, I'm satisfied with the start of the Tour Down Under and the season." 10. Francisco Ventoso (Spa) CCC. 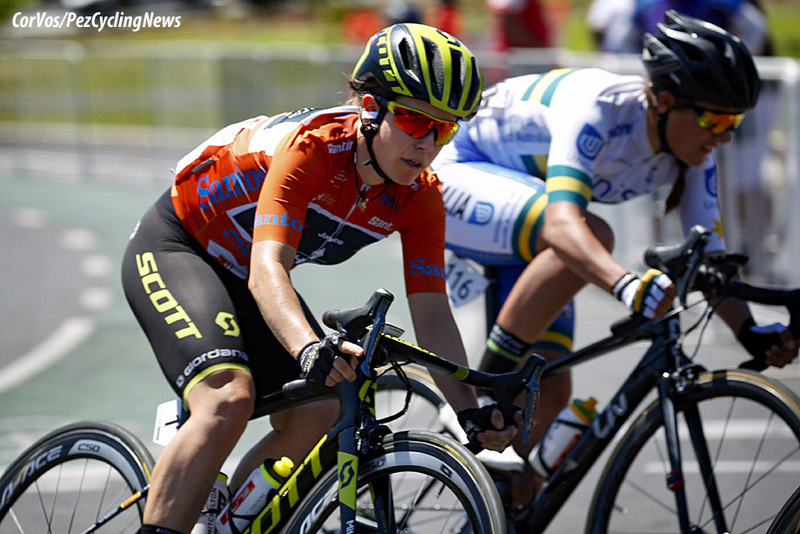 At the end of stage 4, Amanda Spratt (Mitchelton Scott) was the overall winner of the 2019 Women's Tour Down Under. The 31-year-old Australian managed to keep her leader's jersey on the final stage in Adelaide without any problems. The stage victory went to Chloe Hosking in a sprint finish. Spratt won the Women's TDU for the third year in a row. She took charge on stage 2 to Angaston taking a solo victory and then held the overall lead to the end of stage 4. The 42.5-kilometer-long final stage to Adelaide did not have any climbs, so there was a fast final stage of the 8th edition of the Women's Tour Down Under. Several riders - including Spratt - tried to break-away, but in the end it came down to a sprint finish. Hosking (Alé Cipollini) turned out to be the fastest ahead of Italian Rachele Barberie and home rider, Sarah Roy. Women's Tour Down Under winner, Amanda Spratt (Mitchelton Scott): "I'm so happy! I really have to thank my team. It is so special to win here, for my home crowd. The Women's Tour Down Under is one of my main goals. We have such a strong team, we are truly a unit. Everyone is willing to work. I really have to thank my team." 10. Ruth Winder (USA) Trek-Segafredo at 1:54. 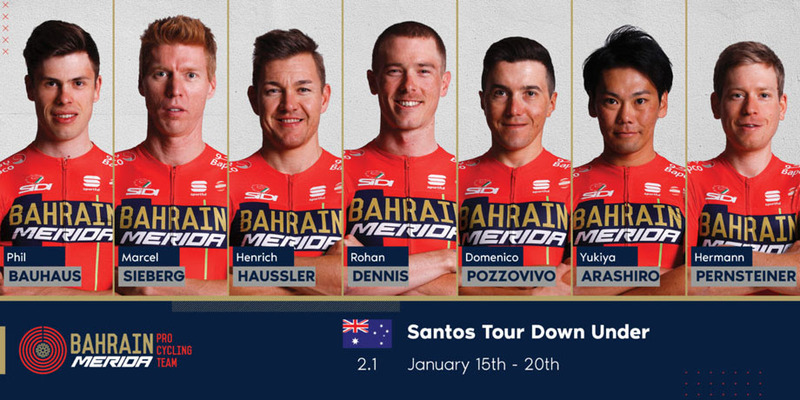 Santos Tour Down Under from 15 to 20 January, Team BAHRAIN MERIDA is ready for our first season 2019. Kick off at the heat of South Australia and he first stop for the world's best cycling teams and riders, and is the opening event of the UCI World Tour. In 2008 the Santos Tour Down Under became the first race outside of Europe to receive prestigious UCI World Tour status to guarantee the world's best elite teams would make their way to Adelaide. First edition was held in 1999, the Santos Tour Down Under is the biggest cycling race in the southern hemisphere. In Adelaide, Australia where the Tour starts from North Adelaide where the riders will strive for glory at one classic race and 6 exciting stages. "We have a really strong lineup, it's more a team for GC, so the main focus will be on GC", commented our sports director Tristan Hoffman. "Domenico Pozzovivo and Rohan Dennis will share the leadership. Our team did really well at our December training camp in Hvar, Croatia. Rohan and Heino came a bit earlier to Australia and got used to the summer conditions and did good job here at the nationals. We are happy to launch Rohan Dennis, Marcel Sieberg and Phil Bauhaus as our new riders here and together with a big help and tactical skills of Heinrich Haussler, experience of Yukiya Arashiro and potential of Hermann Pernsteiner we are looking forward to achieve good results at Tour of Down Under. We hope that one of our two leaders finish in top rankings and hopefully Bauhaus will grab his chances for good sprints." Domenico Pozzovivo, one of our leaders: "I was working to be in a good shape at the start of my 5th attendance at TDU as a leader with Rohan and be a protagonist at the last stage. Yesterday at the training I had a crash as we were going really fast. In the past I had number of such accidents and injuries and I believe that I will be ready for the Saturdays' start. My objective will be to reach the top 10 in GC. I think we have a very good roster at the start of this race and for me it's always a pleasure to start the season in South Australia because of the heat, good weather, the beautiful roads to race and a very competent public following every stage." Rohan Dennis is excited and looking positive in the eve of his homeland race; "It is great to be back in Adelaide where I grew up and where my family lives. It is really hot down here and it is another challenge for me and my new team. Here we have a very strong team. Domenico is our big and experienced leader with lots of participations at TDU and we have Phil Bauhaus for sprints at most of the stages. I will see now how my preparations were successful and I believe that all is as I expected for the start of the season with my new team." 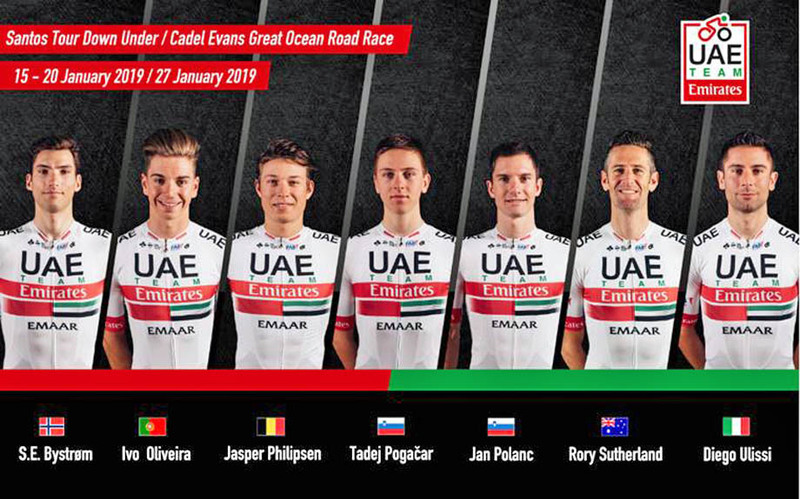 The UCI World Tour 2019 is just around the corner and UAE Team Emirates has announced a fresh looking line-up for the opening race of the season, the Santos Tour Down Under. There are debuts for winter signings Ivo Oliveira and Jasper Philipsen, whilst Tadej Pogačar, who signed his first professional contract with the team back in August, will also make his hotly anticipated debut in Emirati colors. The trio of new comers will be joined by teammates Diego Ulissi, Jan Polanc, Sven Erik Bystrom and Rory Sutherland – the latter of whom will be hoping for a strong performance, riding on home soil for the first time in three years. As the opening race on the UCI World Tour calendar, the six-stage Santos Tour Down Under provides a unique challenge to all riders, particularly those used to riding in cooler climates. The temperatures in Adelaide are set to hit upwards of 36 degrees Celsius and could prove to be a major factor for the peloton as the race develops. Before the first stage gets underway, teams will have the chance to test their legs on the 51km People’s Choice Classic – an exciting criterium that will take place on Sunday 13th January. The race features 30 loops around a 1.7km circuit in Adelaide, which will undoubtedly result in a hotly contested bunch sprint finish. Stage One of the Tour Down Under will see the peloton set off from North Adelaide and head into the Adelaide Hills, where they will work their way around a circuit before turning back into the city and crossing the finish line in Port Adelaide. The second stage will push riders out into the well-known Barossa Valley. This stage has produced some sensational performances, particularly when it comes to the up-hill sprint finish, where sprinters will have to time their challenge to perfection to have any chance of taking the victory. Stage Three from Lobethal to Uraidla should be a straightforward stage for many riders, but the introduction of a 14km circuit in the closing part of the race could throw up unexpected surprises as the sprinters and their lead out teams fight for position at the front of the bunch. Riders return to the Adelaide Hills for Stage Four, for a relatively short race at just 129km. However, anyone suffering from fatigue will face the daunting task of tackling the corkscrew climb in the final 7kms and a steep downhill finish – this could be a definitive stage in the General Classification (GC) standings. The sprinters will undoubtedly dominate the penultimate stage, a flat 149.5km route from the Glenelg coast to the small town of Strathalbyn. The final stage will be contested on a summit finish at Willunga Hill – a new look for the tour which has traditionally ended with a sprint stage through the city-centre. Spectators can expect this to go right down to the wire, in what has grown to become a spectacular way to start the cycling season. UAE Team Emirates’ participation on the UCI World Tour gives the region’s community the opportunity to come together and support world-class athletes as they aim to become one of the top cycling teams in the sport. To find out more about UAE Team Emirates, visit UAETeamEmirates.com. The season opening Tour Down Under is all set to take place between 15 and 20 January. 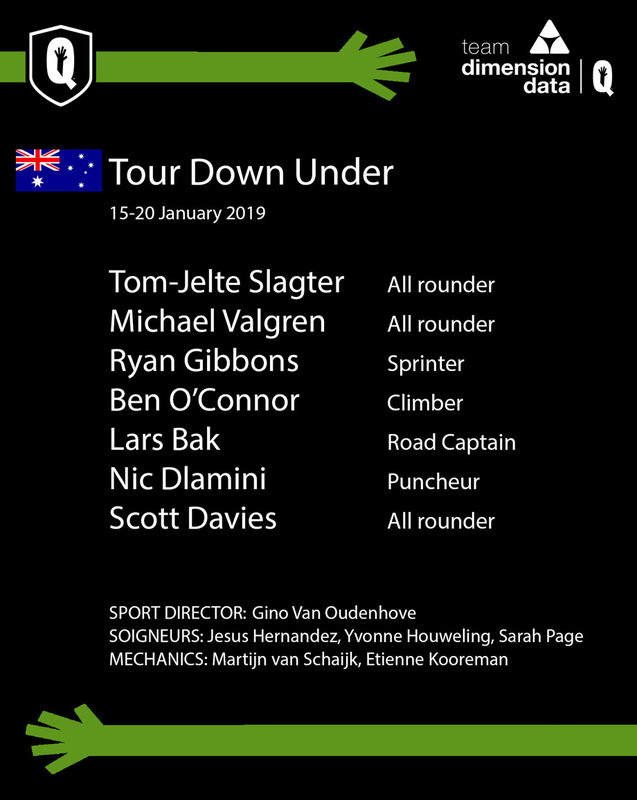 Team Dimension Data for Qhubeka will hope to get the season off to a flying start, as we did last year at TDU, when Tom-Jelte Slagter finished 3rd overall and Nic Dlamini won the King of the Mountains prize. Michael Valgren – A new year and a new team for the Danish talent, Valgren is looking to get the season off to a fast start in our African team colors. Tom-Jelte Slagter – A former TDU winner and last year’s 3rd place finisher, Slagter has what it takes to win Down Under. “We have a really good team for Tour Down Under, probably our strongest ever at this race so we are certainly capable of making a good result here. Personally, I’ve been training hard to be good here so I hope it will pay off and we can achieve something similar to last year. We have to say the route is also more difficult than previous years and the temperature is rising so It wont be easy, but we are ready.” – Tom-Jelte Slagter. Stage 4 – The Corkscrew Road climb at 6km to go will be sure to shake up the GC. Stage 6 – The famous Willunga Hill moves to the final stage and will decide the overall, what a spectacle this stage will be! The official start of the 2019 cycling season has arrived! From 15 to 20 January, the Tour Down Under will take place. The Australian stage race means the first official event for some new Lotto Soudal riders such as Adam Blythe, Carl Fredrik Hagen, Roger Kluge and Caleb Ewan. The 24-year-old sprinter is looking forward to his race on home grounds and targets a stage win. The sports director of Lotto Soudal at the Tour Down Under is Mario Aerts. He previews the course and explains the main goal of Lotto Soudal during the first WorldTour race of the season. Stage 6 Sunday 20 January: McLaren Vale - Willunga Hill (151.5 km). Adam Blythe, Thomas De Gendt, Caleb Ewan, Carl Fredrik Hagen, Adam Hansen, Roger Kluge and Tomasz Marczyński. What do you think of the course of this year’s Santos Tour Down Under? The stage to Uraidla counts over a 3000 altitude meters. Can it be more decisive than the Willunga stage? The organizers of the Tour de France have chosen the first teams for the 106th edition of the Tour de France (6–28 July). AG2R LA MONDIALE, ASTANA PRO TEAM, BAHRAIN – MERIDA, BORA – HANSGROHE, CCC TEAM, DECEUNINCK – QUICK-STEP, EF EDUCATION FIRST, GROUPAMA – FDJ, LOTTO SOUDAL, MOVISTAR TEAM, MITCHELTON – SCOTT, TEAM DIMENSION DATA, TEAM JUMBO-VISMA, TEAM KATUSHA ALPECIN, TEAM SKY, TEAM SUNWEB, TREK-SEGAFREDO, UAE TEAM EMIRATES. 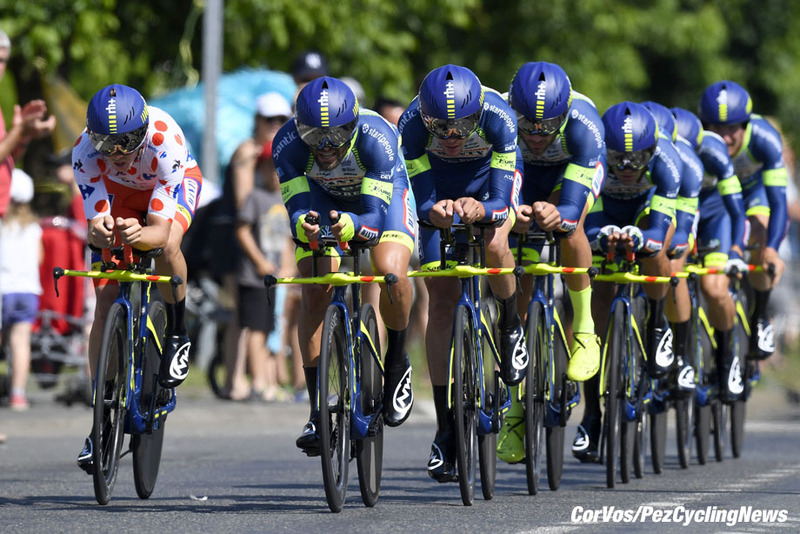 WANTY - GROUPE GOBERT, COFIDIS, SOLUTIONS CRÉDITS. The final two teams will be announced at a later time. Third Tour de France: "Reward for Wanty-Gobert"
ASO, the organizer of the Tour de France, announced this afternoon a first selection of teams for the next Grande Boucle. The French organizer invites us for the third year in a row to the biggest cycling event in the world. Wanty-Gobert Cycling Team will present itself at the Grand Départ of the Tour de France in Brussels on July the 6th. Three Belgian teams will be at the start of the 106th edition of the Tour, which will pay tribute to Eddy Merckx. An invitation to the delight of sports management, sponsors and of course the riders. Guillaume Martin (rider): "This third invitation proves that we have not stolen our place in the Tour de France for the past two years. I thank ASO for the trust in us and for announcing our selection as one of the first two invited teams. Thus we can plan the season with serenity." "I still feel that I have not been able to leave 100% of my mark on the Tour of 2018. Although my first participation was satisfying, many details have messed up my plans in the past year, our 2nd participation. I came close to the white jersey, but could never wear it. In the last stages I tumbled down in the GC. I did not feel well and a broken rib did not help." "The 2019 edition should suit me! It is similar to the one of 2017. I already looked at it, but with the announcement of this invitation I will certainly study more thoroughly in the upcoming days and weeks. Since I now live in Pau I know the course of the time trial, which will not be easy. I have already climbed the Soulor and Tourmalet in the Pyrenees. In Alsace I know quite well the region since I have also lived in Strasbourg. Long live the summer!" "The Grand Départ of the Tour de France in Brussels will be a highlight of our season and in the history of the team. The start of the third stage in Binche, home of our title partner Wanty, promises to be a big party for the cycling world." "This invitation is a strong signal for the work we have been doing for a number of years, which further strengthens the long-term commitment of our project, faithful to our values ​​and our philosophy. We progress year after year. We will start the 2019 campaign on the same basis and I want to thank Christian Prudhomme and his ASO team for the trust and credibility they place in our team and our vision of cycling." Hilaire Van der Schueren (sports director): "I am very pleased with this invitation and I am already looking forward to the great moments we will experience this summer: the Grand Départ of Brussels, the start of the third stage in Binche, and especially the passage of the peloton, on the first day, through Geraardsbergen, in front of my house, before they climb the Bosberg. All these elements make that edition 2019 will be a very important Tour de France for us." "Now we have to prove from the beginning of the season that ASO has not made a mistake by giving us an invitation. We proved that we have done well in our first two participations, true to our will to animate the race by attacking in almost every stage. Our first place in the UCI Europe Tour also helped us, so I'm happy to receive this invitation because the choice for the organization was not easy." The Omloop Het Nieuwsblad for women organizers have announced the teams that will be on the start line on Saturday, March 2. A total of twenty UCI teams and four club teams have been invited including the new Trek-Segafredo and CCC-Liv teams. The Omloop Het Nieuwsblad for women - which will be held on the same day as the men's race - was won last year by the Dane Christina Siggaard. She beat the American Alexis Ryan and Italian Maria Giulia Confalonieri in Ninove, Belgium. Alé Cipollini (Ita), Bigla (Sui), BePink (Ita), Boels-Dolmans (Ned), BTC City Ljbuljana (Slo), Canyon-SRAM (Ger), Doltcini-Van Eyck Sport (Bel), FDJ-Nouvelle Aquitaine-Futuroscope (Fra), Health Mate-Cyclelive (Bel), Hitec Products-Birk Sport (Nor), Lotto Soudal Ladies (Bel), Mitchelton-Scott (Aus), Movistar (Spa), Parkhotel Valkenburg (Ned), CCC-Liv (Pol), Team Sunweb (Ned), Trek-Segafredo (USA), Virtu (Den), Valcar Cylance (Ita), World Cycling Center (Sui). Isorex-No Aqua (Bel), Kitchens-Redant (Bel), Multum Accountant Ladies (Bel), Rogelli-Gyproc (Ned). The Danish rider has signed a new contract that will see him stay with the team through 2021. 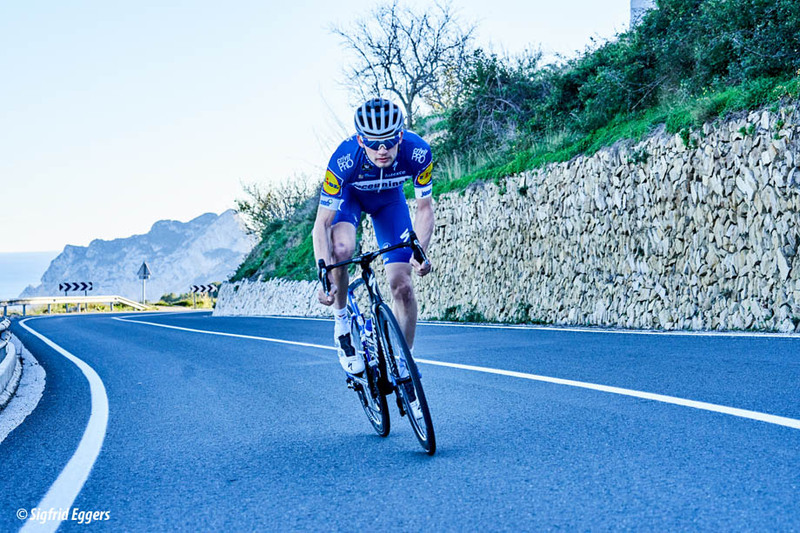 The 23-year-old Kasper helped Deceuninck – Quick-Step become the world’s number 1 cycling team in 2018, with a series of strong rides in both the classics and his first Grand Tour, the Vuelta a España. He then went on to be part of the six-man squad that won the World Team Time Trial Championships in Innsbruck, becoming only the third neo-pro in history to claim gold in this discipline. The upcoming Tour Down Under will be the first real event of the season for Lotto Soudal. The Belgian WorldTour team went through some changes as it was delighted to welcome some new riders and staff members. That way, Lotto Soudal is completely ready to make 2019 a successful season! 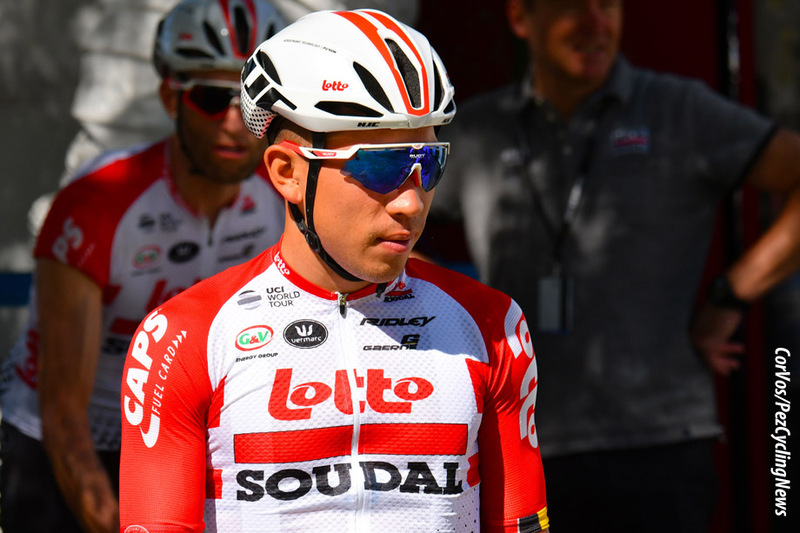 Lotto Soudal is excited to have the young and promising sprinter Caleb Ewan on board. The 24-year-old Australian will start the season in his home country during the Tour Down Under. After that, Ewan will take part in the inaugural edition of the UAE Tour. Soon after, Paris-Nice is scheduled where he will prepare for the first monument of the season, Milan-San Remo. Ewan hopes to have another shot at the victory on the Via Roma as he sprinted to a second place last year. After a short break, Ewan will possibly resume competition during the Tour of Turkey. In July, the Australian sprinter will debut in the Tour de France, where he will be looking for a stage win. His first Tour will possibly be preceded by the Giro in May and the Tour of Belgium in June. The spearhead of Lotto Soudal during the spring Classics will be Tiesj Benoot, who aims for another Classic win after his triumph in the Strade Bianche last year. Tiesj will race his first kilometers of the season in the Vuelta a San Juan (Argentina) and will then prepare for the Belgian opening weekend during an altitude training camp. Contrary to last year, the 24-year-old Belgian will start in both the Tour of Flanders and Paris-Roubaix. However, he will not compete in the Flèche Wallonne and Liège-Bastogne-Liège. For the third consecutive year, Tiesj will be at the start line of the Tour de France. By the end of the season, Benoot aims to be in top shape for the world championships which are organized in Yorkshire. Thomas De Gendt - winner of the KOM jersey during the 2018 Vuelta a España - will include the three Grand Tours in his race schedule. He will once again be hunting stage wins with his typical offensive style of racing. Just like last year - when he won the Brabantse Pijl - Tim Wellens will target the Ardennes Classics, races he will prepare on Mallorca and in Bessèges, followed by Paris-Nice and the Volta a Catalunya. Wellens will take a short break before getting ready for the Tour de France. The 27-year-old Belgian will pursue top form by the time the world championships in Great-Britain start, where he will find a course suited to his abilities. With a bronze medal in the time trial world championships last year, Victor Campenaerts proved to be close to the world’s best time trialists. The double European champion against the clock wants to take another step forward this year. Campenaerts will prepare for the start of the season with a long training camp in Namibia. The Belgian again aims for individual time trial success. In addition, he will ride the same two Grand Tours he started last year, the Giro d’Italia and the Vuelta a España. 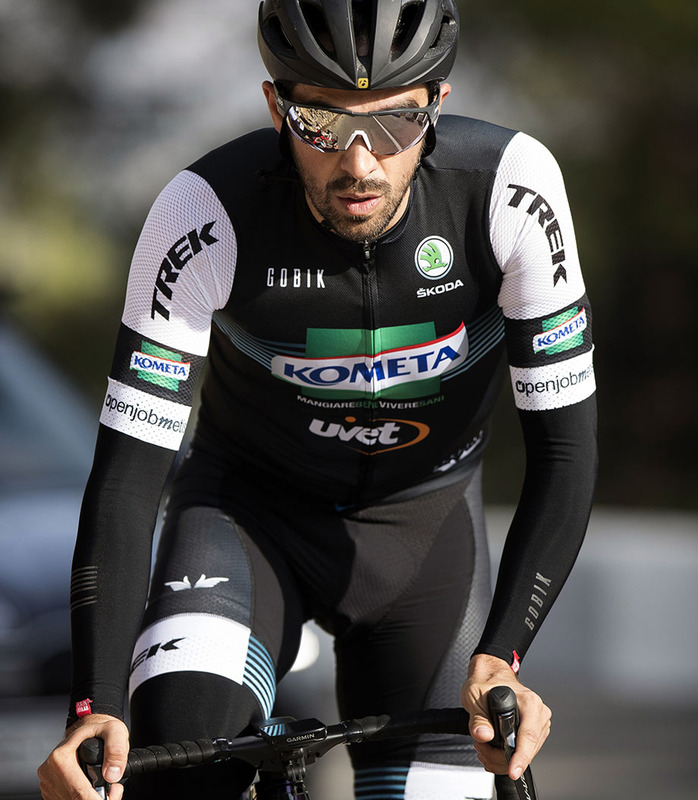 The second-year pro will start his campaign in Portugal, at the 45th edition of Volta ao Algarve. 2018 was a perfect season for rookie Fabio Jakobsen, who found plenty of opportunities to shine and picked up seven victories between March and October – Nokere Koerse, Scheldeprijs (Flanders’ oldest race, where he became the youngest rider this century to surge to victory), two stages at the Tour of Guangxi, and one apiece at the Tour des Fjords, Eneco Tour and Tour of Slovakia – as well as wrapping up the points classification in China, at the last World Tour event of the year, all in all an amazing roll of achievements which made him the best neo-pro of last year. “Last year in Calpe things were a bit quieter for me at the press conference, but things have changed in the meantime after the season I had. It’s true that I trained a lot and was confident, but it wouldn’t have been possible without a great team, the best in the world. That’s what made the difference”, a smiling Fabio said to the half a dozen journalists gathered around him during this week’s team presentation in Calpe. 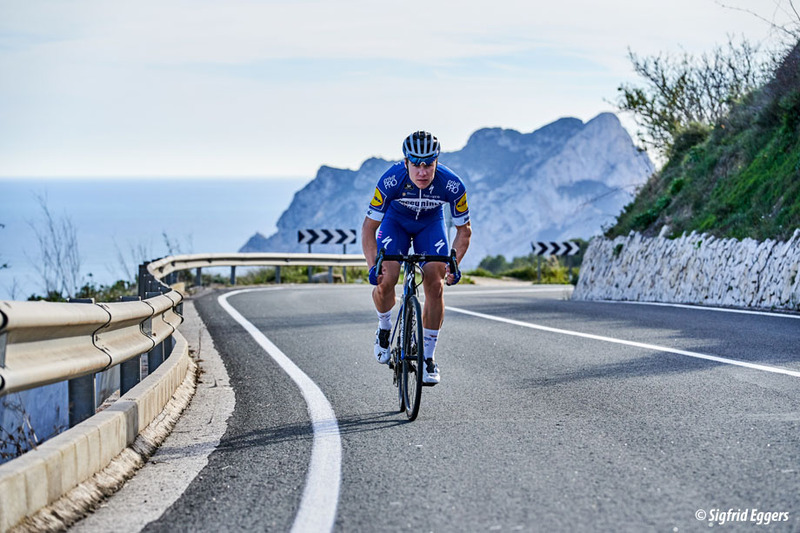 Having signed off the team’s final World Tour victory of the year, which capped off a brilliant season for Deceuninck – Quick-Step, Fabio is determined to show last year’s results weren’t a fluke, as he will target other races while continuing his rise through the ranks. “The results I got last year only motivate me even more for this season, where I hope to continue my development, become faster and get more victories for the team in bigger races, against top-level sprinters. Is there any pressure on my shoulders? Yes, I feel some pressure, but it’s more or less the same with every sprinter when you’re the last man in the train and things become hectic. I am aware it won’t be a stroll in the park, but the determination, focus and hunger for victories are there”, concluded Fabio, who will make his first appearance of the year at Volta ao Algarve (20-24 February), from where he’ll travel to Belgium for Kuurne-Brussels-Kuurne and Le Samyn. Initial medical evaluations revealed that his injuries are not serious, with some trauma to the right knee and abrasions on the hip, back and elbow on the right side. However, on medical advice, he will visit a hospital on Friday for a precautionary scan, with the hope that he will be given the all clear. 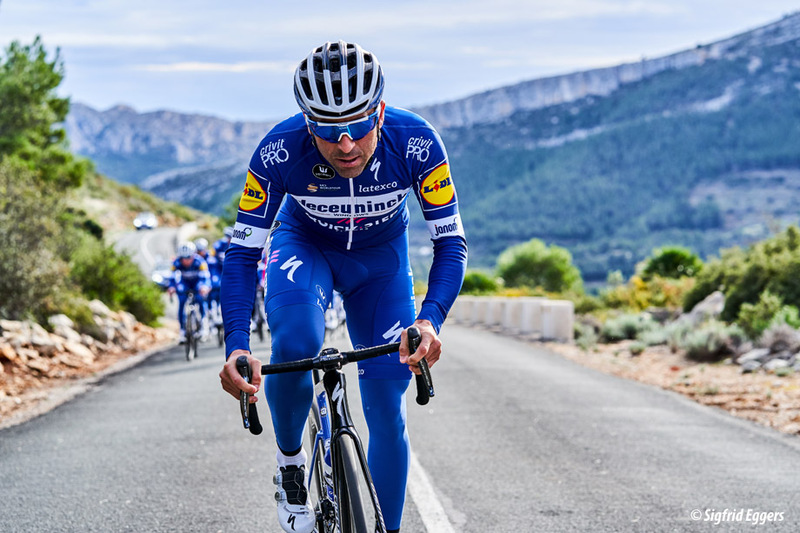 Everybody at Deceuninck – Quick-Step wishes Maximiliano a speedy recovery! UAE Team Emirates would like to wish a warm welcome to our new technical partner: Stages Cycling, which will be our official supplier of power meters and cycling computers. 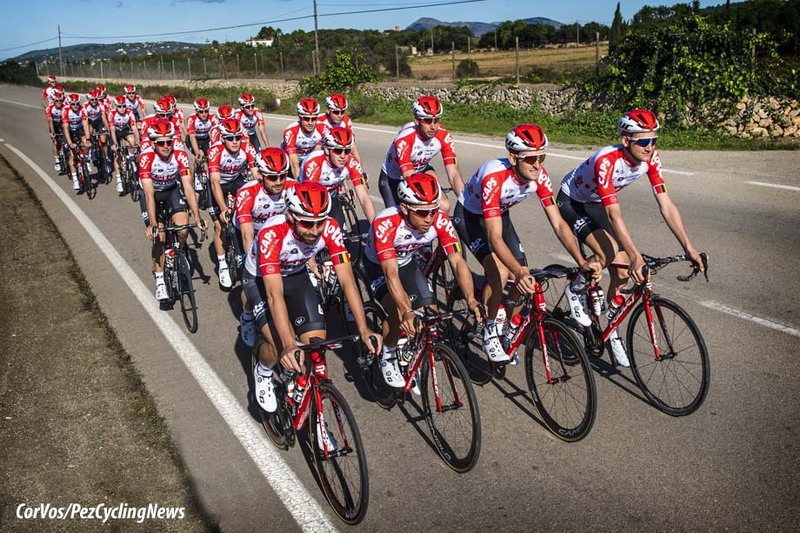 Starting in 2019, all the Colnago bikes in the team from the United Arab Emirates will be fitted with high-end products from this American company, offering the team’s riders and technicians powerfully effective training systems. 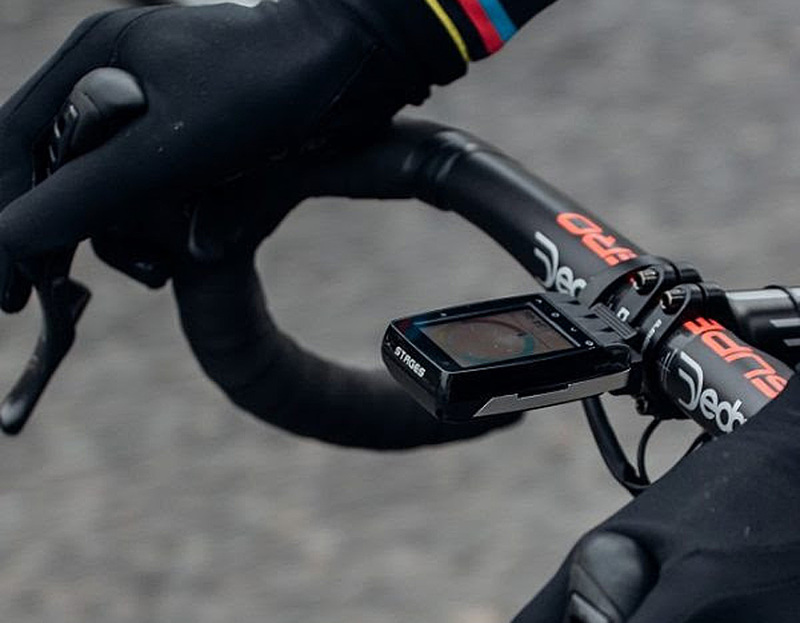 Aru, Gaviria, Martin and all their teammates will be supplied with Stages Gen 3 Campagnolo Super Record 12sp power meters and Stages Dash M50 and L50 GPS cycling computers as well. "Northwave’s constant strive for innovation in every category led the brand to look for a partner sharing the same values and ambition. 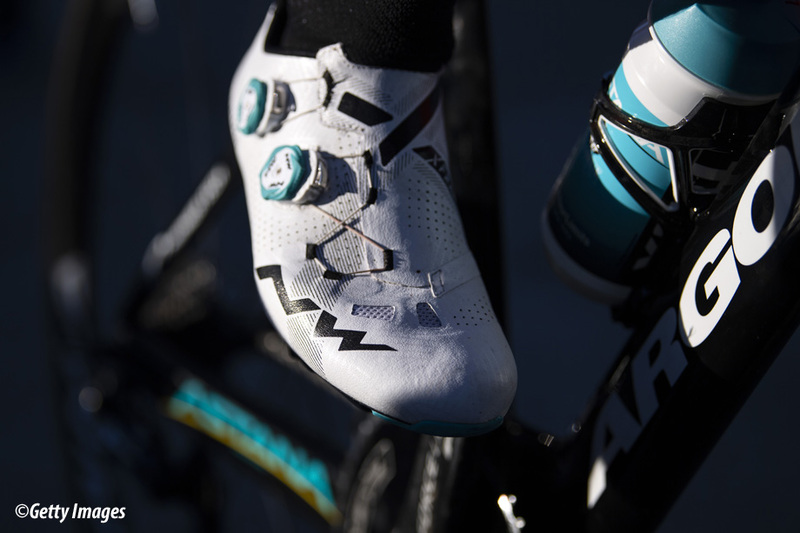 With Astana Pro Team mustache starting an exciting strategic plan aiming to acquire a leading position also in the road bike shoes category," says Northwave’s CEO Davide Rossetti. "We are excited to open a new partnerships with Northwave company. This is a well-known and a quick progressing brand, which is ready to provide Astana Pro Team with the best possible material. Northwave has a wide range of shoes and already now we see a great desire to work hard together with the team aiming the biggest goals in cycling. The shoes are one of the keys of success in cycling, so we are sure that in Northwave our riders will find a great support in achieving both, their personal and team goals," said general manager Alexandr Vinokurov. Alberto Contador, one of the best Spanish cyclists in history, is Gobik's new world ambassador. "Since my retirement from professional cycling I have spent my time between the Alberto Contador Foundation and their different cycling teams, from school to continental squad, the Eurosport cycling broadcasts, to be ambassador of L'Etape du Tour and in coaching conferences for companies", said Alberto Contador. "We're working on this line, and we're taking some time to find the formula. It would be the kind of clothes I'd like to wear. Meanwhile, I continue to test their collections and pass on my knowledge and advice", continues Contador. José Ramón admits that "this brand step towards the world of road racing must serve as a complement to what Gobik already started in 2018 in the MTB World Cup with Primaflor Mondraker and that we will continue in 2019 with the new team of Carlos Coloma-BH Temples Café UCC, Compass Bike, Absolute Absalon, among others". Gobik, is a young and restless cycling apparel company born eight years ago and based in Yecla (Murcia, Spain). Neat lines and vibrant colors to inspire very special and strong clothing that breathe the cyclist personality. This is the definition of Gobik. 100% of the production is made in Spain, although its international progress is constant taking part in international and outstanding events such as Mallorca312, Garmin Titan Desert, Gran Fondo Alberto Contador, Powerade Non Stop Madrid-Tajo Internacional-Lisboa, Transpyr, Mediterranean Epic, Gran Fondo Lisboa, Rally di Romagna.... and World Tour events like Volta a Catalunya. Recently Gobik announced his partnership with pro road team Caja Rural-RGA Seguros and Alberto Contador Foundation teams. Froome Does Have a Sense of Humor! The funniest Tweet we've seen for quite a while came from Chris Froome on Saturday to his mate Peter Sagan. Yes, nice mustache.